The sound of Ich bin meine maschine by Atom reverberates through a dimly-lit concrete box in a residential neighbourhood of Kiev. 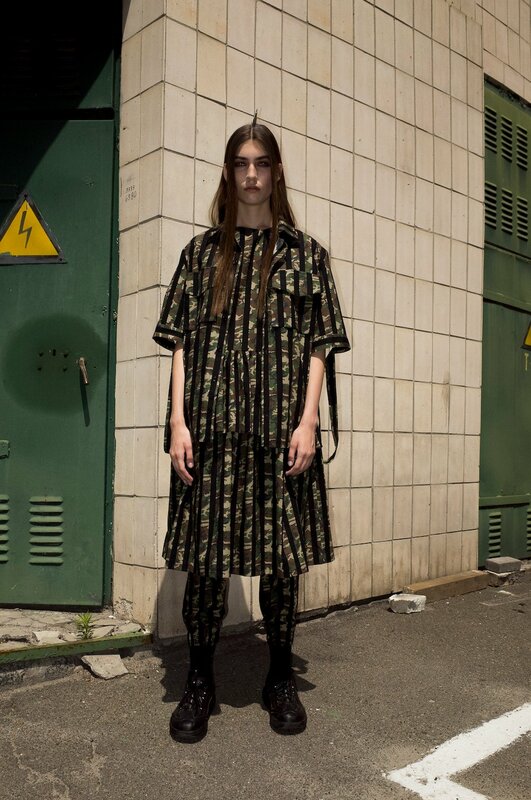 This is the newly opened Jugendhub club, but tonight it’s going back to its industrial roots — thanks to the creative presence of fashion designer Yulia Yefimtchuk. Raw concrete pillars are covered with bright red banners emblazoned with the words “technical aesthetics” in Russian. With their hair neatly parted, models walk briskly down the runway: their moves are robotic, and they’re oblivious to the presence of the show’s guests. 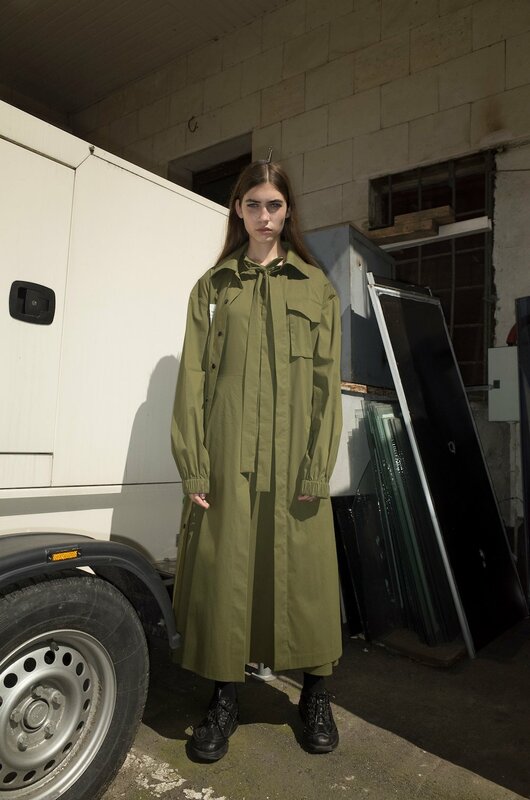 A lot of outfits are clearly inspired by uniforms, Yefimtchuk’s design staple, with boxy geometric cuts and an abundance of pockets. 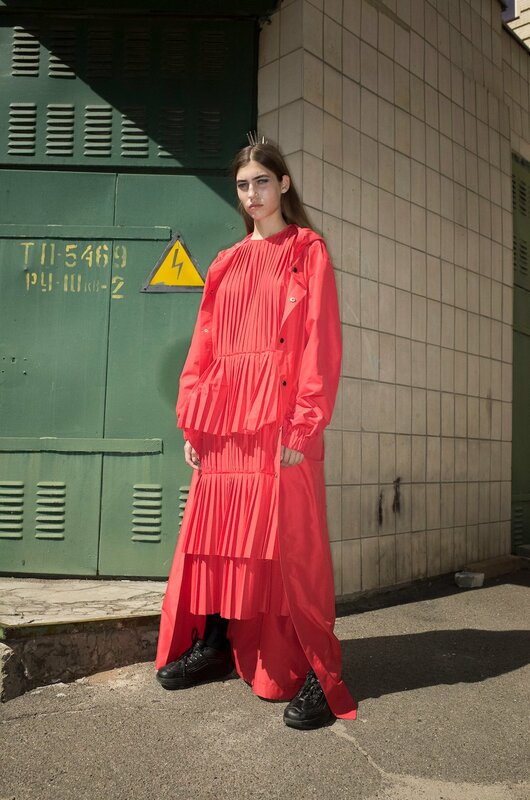 But there is earnest elegance here too, as seen in the elongated blazers or flowing pleated skirts. “Technical aesthetics studies the principles and methods of artistic design,” reads one red banner, and somehow it seems fitting. On the course of her career, Yulia Yefimtchuk has brought the fruits of her research into socialist ideology and Soviet material history to people in Tokyo, Seoul, Paris and New York. She owes her success not only to the unique cultural history behind her garments — but also the plain irresistibility of good design. The phrase “technical aesthetics”, present throughout the collection, is in fact the title of a magazine published in the Soviet Union from 1964 to 1992. Edited by the All-Union Technical Aesthetics Research Institute, it covered topics such as the history, theory and practice of design in the USSR and abroad, art and design education, and even published reviews of design exhibitions and books. The magazine regularly featured Western design trends and innovations, which were often compared with their Soviet counterparts. Looking through the covers of the magazine (the digitalised archive from 1987 can be enjoyed here) takes you on a fascinating journey into an unknown slice of the past. 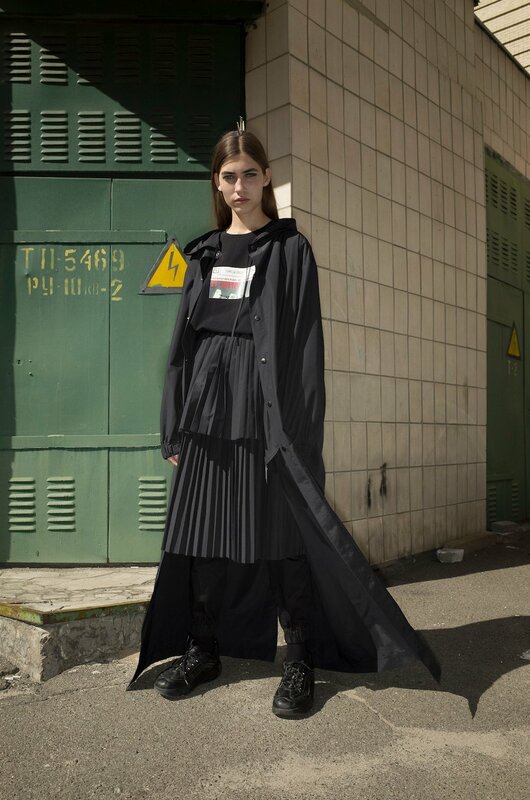 The fashion community first heard of Yulia Yefimtchuk in 2014, when she received special recognition from international retailers Opening Ceremony at Hyeres Festival, established to promote young creative talent in fashion and photography. In her collection, Yefimtchuk used propaganda slogans from Soviet posters – “Every day it becomes happier to live” (“С каждым днем все радостнее жить”), “Labour” (“Труд”) and “Peace to the World” (“Миру Мир”) — printed in original font on black, white and bright red garments. It radiated the stark force of Constructivism, and evoked Malevich paintings — in a fresh, contemporary and globally relevant way. The appearance of Soviet slogans has shifted considerably since then. 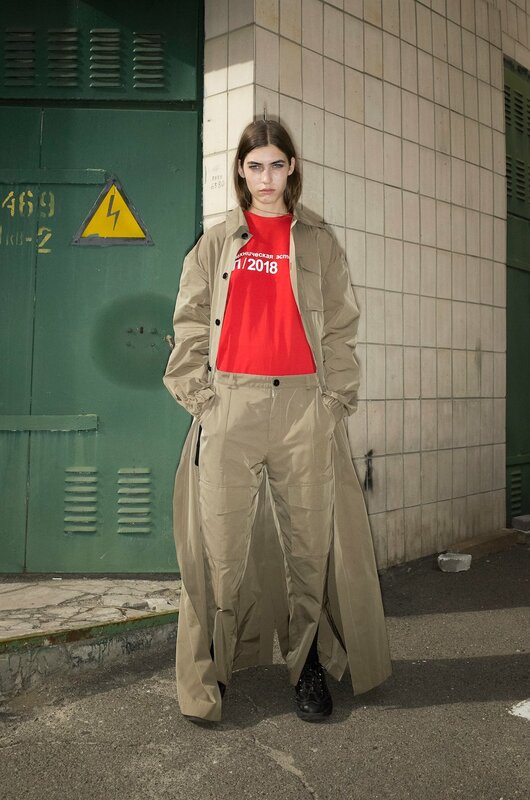 In the past few years, fashion has seen the rise of the so-called post-Soviet aesthetic, with Cyrillic script quickly turning into a must-have design staple. 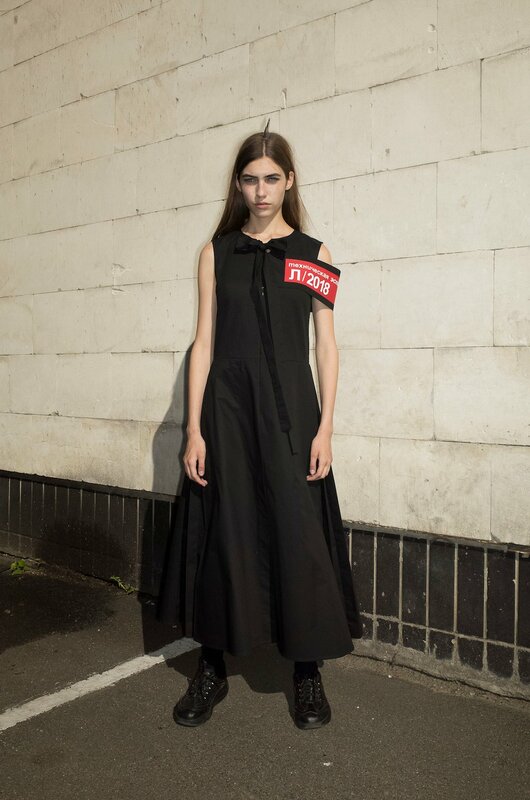 Soviet iconography has made it into the mainstream, at times as a sign of prized authenticity, like in the work of Gosha Rubchinskiy, at other times as a meta-joke, like the Vetements hammer and sickle sweatshirt worn by Kim Kardashian, and finally, as an ornament stripped of meaning on a sweater in a fast-fashion store. Dedicated to the Youth of the World (Yulia Yefimtchuk+) from Yarema&Himey on Vimeo. Yefimtchuk does draw from the past, but deep down her work is much more about the present, and about the future — an artistic projection of what the future could be. In a film titled Dedicated to the Youth of the World, made for the designer by Yarema and Himey, we see a bunch of youngsters idling in the fields by an unknown city. Dressed in Yefimtchuk’s garments, they look like a new breed of dreamers free from borders and nationalities, an embodiment of the hope for peace in the world on the brink of collapse. In today’s world, this kind of utopian vision is perhaps just what we need.